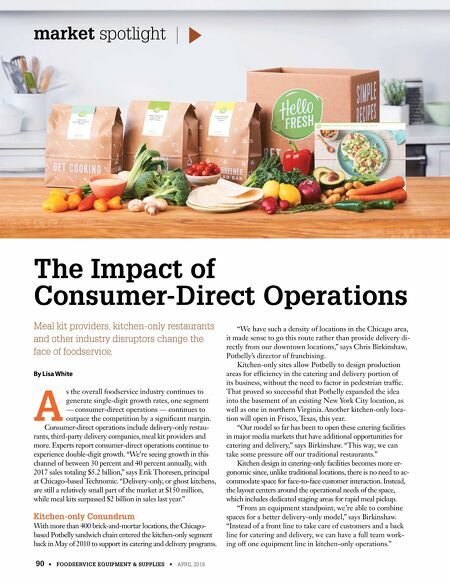 90 • FOODSERVICE EQUIPMENT & SUPPLIES • APRIL 2018 The Impact of Consumer-Direct Operations market spotlight Meal kit providers, kitchen-only restaurants and other industry disruptors change the face of foodservice. By Lisa White A s the overall foodservice industry continues to generate single-digit growth rates, one segment — consumer-direct operations — continues to outpace the competition by a significant margin. Consumer-direct operations include delivery-only restau- rants, third-party delivery companies, meal kit providers and more. Experts report consumer-direct operations continue to experience double-digit growth. "We're seeing growth in this channel of between 30 percent and 40 percent annually, with 2017 sales totaling $5.2 billion," says Erik Thoresen, principal at Chicago-based Technomic. "Delivery-only, or ghost kitchens, are still a relatively small part of the market at $150 million, while meal kits surpassed $2 billion in sales last year." Kitchen-only Conundrum With more than 400 brick-and-mortar locations, the Chicago- based Potbelly sandwich chain entered the kitchen-only segment back in May of 2010 to support its catering and delivery programs. "We have such a density of locations in the Chicago area, it made sense to go this route rather than provide delivery di- rectly from our downtown locations," says Chris Birkinshaw, Potbelly's director of franchising. Kitchen-only sites allow Potbelly to design production areas for efficiency in the catering and delivery portion of its business, without the need to factor in pedestrian traffic. That proved so successful that Potbelly expanded the idea into the basement of an existing New York City location, as well as one in northern Virginia. Another kitchen-only loca- tion will open in Frisco, Texas, this year. "Our model so far has been to open these catering facilities in major media markets that have additional opportunities for catering and delivery," says Birkinshaw. "This way, we can take some pressure off our traditional restaurants." Kitchen design in catering-only facilities becomes more er- gonomic since, unlike traditional locations, there is no need to ac- commodate space for face-to-face customer interaction. Instead, the layout centers around the operational needs of the space, which includes dedicated staging areas for rapid meal pickup. "From an equipment standpoint, we're able to combine spaces for a better delivery-only model," says Birkinshaw. 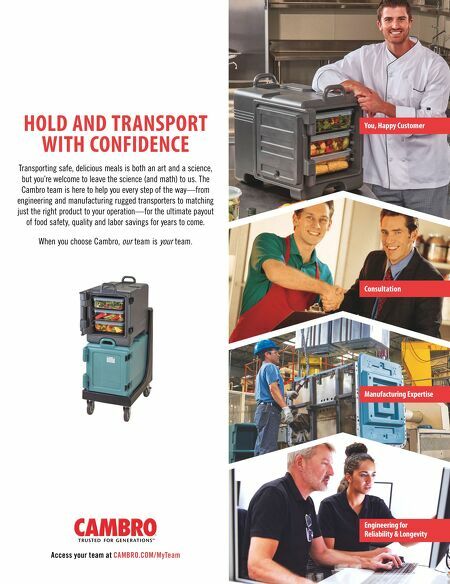 "Instead of a front line to take care of customers and a back line for catering and delivery, we can have a full team work- ing off one equipment line in kitchen-only operations."